So. The big day is tomorrow! 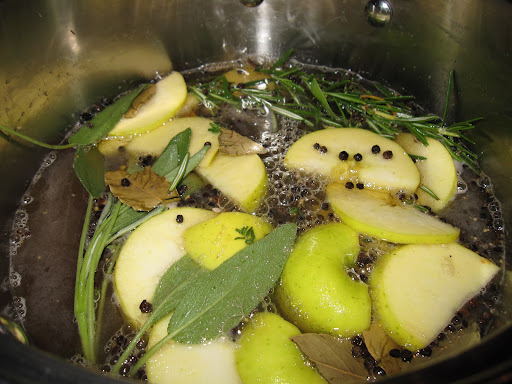 Included in this brine are: 1 sliced apple, 2 sprigs fresh sage, 4 sprigs fresh rosemary, 3 sprigs fresh thyme, 5 bay leaves, 1 tablespoon black peppercorns, 3 sticks of cinnamon, 2 cups of coarse salt and 2 litres of apple cider. After bringing this to a boil, I added about 3L of cool water to bring down the temperature. 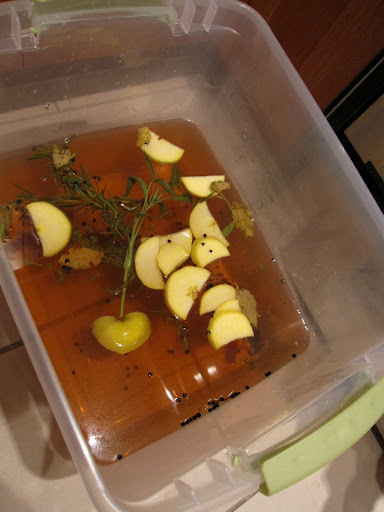 After about 30 minutes, I transferred it over to my brining tub and added more water. 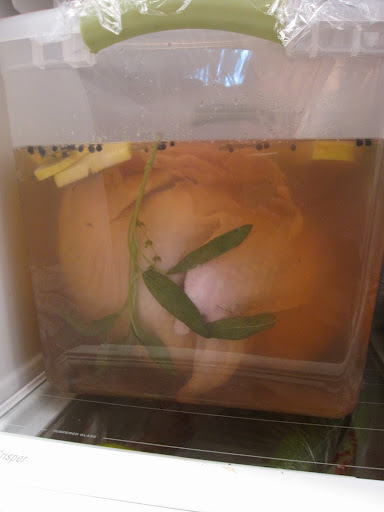 You must not soak your turkey until your brining liquid is cool – I forgot why, but it’s got something to do with bacterial growth I think. I’ll be sure to do some research and update this post. 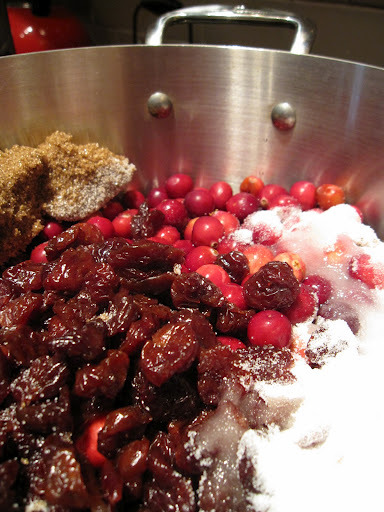 Included is – 1 package of cranberries, 1 cup dried cherries, 1/2 cup white sugar, 1/2 cup brown sugar, 1 tablespoon red wine vinegar, 1 cup of water. Let cook, enjoy hearing the cranberries pop and smush away! The cranberries should release all their wonderful juice and let reduce, like jam! I still had the entire day ahead of me, so under Koi’s supervision I also prepared the ‘onion part’ of a roasted onion/gruyere dish I’m adding tomorrow. It’s pretty much different kinds of onions, lightly seasoned and then roasted until soft. Prep some croutons & sprinkle on top and then add gruyere cheese and bake until bubbly! I decided to get ahead of the game and roast the onions, which will save me a lot of time tomorrow. It will reheat in the oven while the turkey is resting before carving. So T-minus 19 hours until eating time!